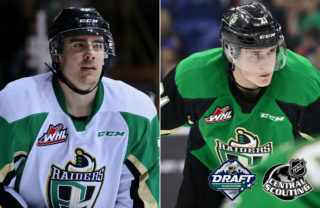 The Western Hockey League is pleased to announce the WHL Three Stars for the second round of the 2019 WHL Playoffs. 1. 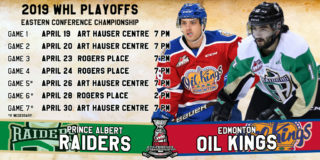 Dante Hannoun, Prince Albert Raiders: After the first two rounds of playoffs, Dante Hannoun is tied for first in scoring among all WHL skaters with 14 points (9G-5A), with nine of those points (7G-2A) gained in the second-round series between the Prince Albert Raiders and Saskatoon Blades. 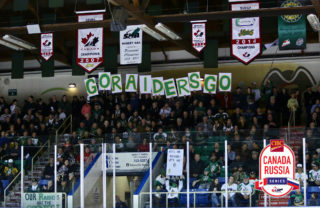 Attaining three multi-point games in the Raiders’ 4-2 series win against the Blades, Hannoun’s highlight performance came in Game 6 of the series. Recording his first WHL Playoff hat trick, Hannoun also earned the first star of the night in the WHL. For his efforts against the Blades, the Delta, B.C. 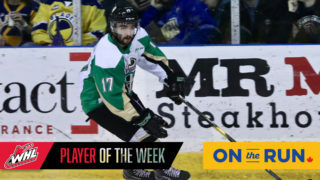 native was also awarded the WHL On the Run Player of the week award for the week ending April 14, 2019. 2. 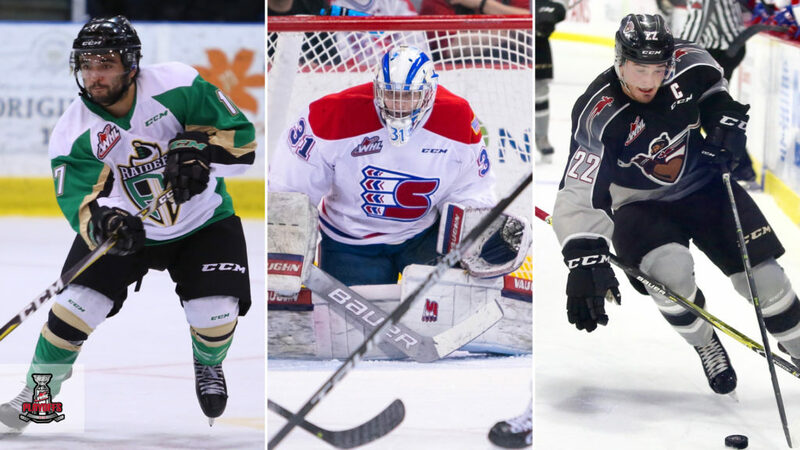 Bailey Brkin, Spokane Chiefs: While all goaltenders played phenomenally in the second round, Bailey Brkin stood on his head for the Spokane Chiefs. During their series against the Everett Silvertips, Brkin sported a 4-1-0-0 record, 1.81 goals-against average and stopped 145 of 154 shots for a .942 save percentage. The Sherwood Park, Alta. product was particularly spectacular in holding off the Silvertips’ strong offense during the series and it showed in around the league. 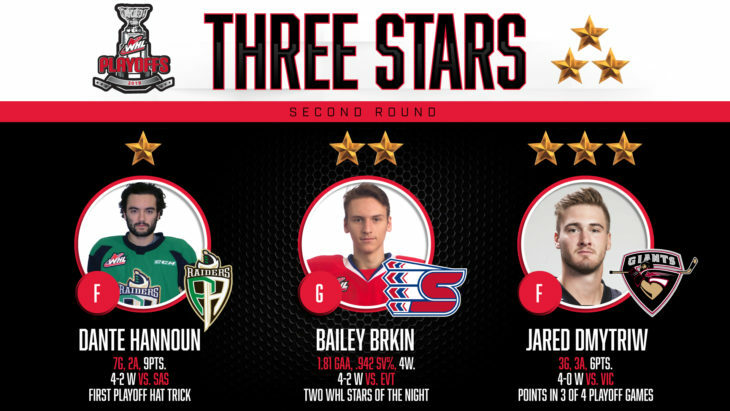 Brkin was awarded the first star of the game and the first star of the night in the WHL in two separate games as well as the third star of the night in the WHL in the third game for his terrific saves. 3. 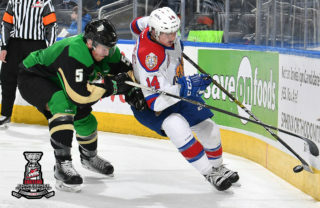 Jared Dmytriw, Vancouver Giants: The Vancouver Giants captain also had a strong second-round series as a key player in the sweep of the Victoria Royals. 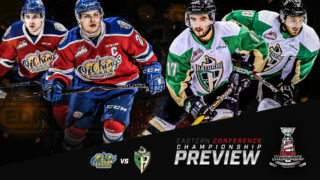 Scoring in three of the four WHL playoff games in the second round, Jared Dmytriw collected six points (3G-3A), five of those at even strength, acting as an offensive driving force for the Giants. The Craven, Sask. forward was spectacular in Game 4 of the series where he notched two assists and the final goal of the game to punch Vancouver’s ticket to the Western Conference Championship. He was also awarded the third star of the game and the third star of the night in the WHL.